Forward Movement had a booth at the Episcopal Youth Event earlier this month. They showcased their books, publicized Lent Madness, and engaged in deep conversations. 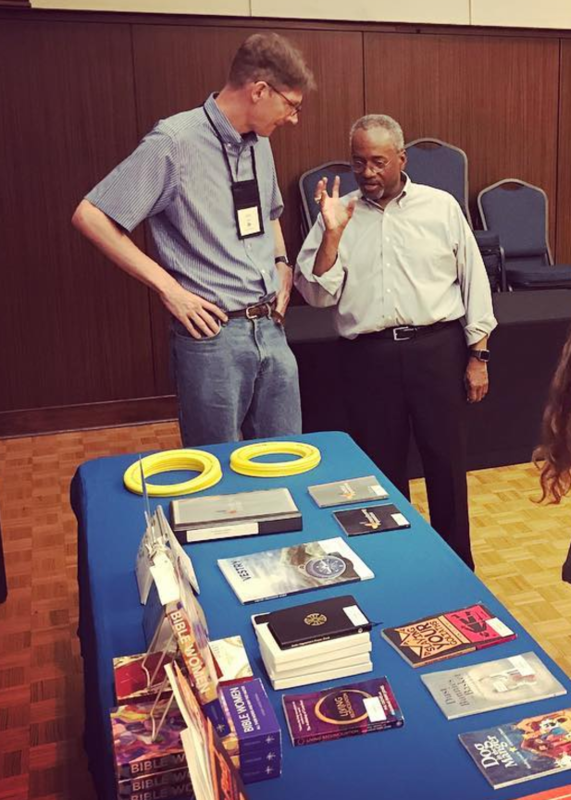 The Presiding Bishop in deep conversation with Forward Movement’s Executive Director at the Forward Movement table. There are a lot of books on that table, aren’t there? Aren’t you curious about which one was the most popular book among the youth at the Episcopal Youth Event? I wasn’t there, but I heard from a staff member at the table that there was a clear winner. 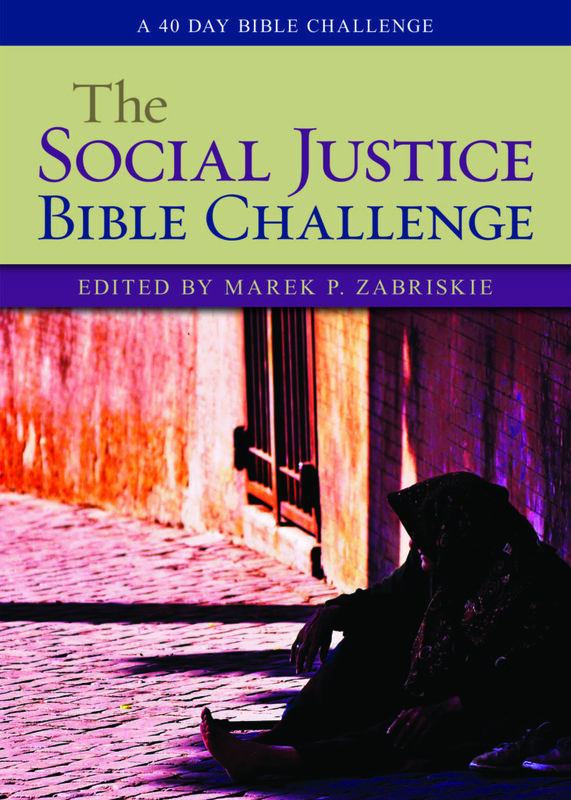 It was one of Forward Movement’s newest releases: The Social Justice Bible Challenge. It’s still on pre-order, but there was a print copy available at EYE. It got picked up more than anything else did. This book is part of the Bible Challenge series. Earlier books in the series walk the reader through the entire Bible or focus on a single Gospel. This one takes a new approach, highlighting the Bible’s key texts and inviting reflection and prayer from the perspective of social justice. It’s no wonder that youth were drawn to this book. Along with offering an overview of the entire Bible, it also includes reflections and original prayers from contemporary leaders – both clergy and lay – deeply engaged in Christ’s mission in the world today. There are forty days of readings. Each day features a selection from Holy Scripture, a reflection on the text, and an original prayer. Authors include ministry founders, clergy and laity, bishops and professors. They are a great cloud of witnesses that demonstrate the engagement of the church with the issues of the day. Their reflections make clear that social justice is not theory, but practice. It is not only the prayer of the church but also the church’s daily work. Jesus constantly pushes against the boundaries of his society, stretching them to allow more people to be embraced by God’s compassion, grace, and forgiveness. Jesus not only challenges his disciples to care for the poor and marginalized, he commands them to open their homes to the poor, the blind, the maimed, and the outcast. [Jesus] said also to the one who had invited him, “When you give a luncheon or a dinner, do not invite your friends or your brothers or your relatives or rich neighbors, in case they may invite you in return, and you would be repaid. But when you give a banquet, invite the poor, the crippled, the lame, and the blind. And you will be blessed, because they cannot repay you, for you will be repaid at the resurrection of the righteous” (Luke 12-14). Maybe the youth picking up this book are a sign to all of us to remember the message the Bible brings us: that Christ came to reconcile the world–all of it–with God. As members of the body of Christ, we are to be bearers of God’s light and love in this world. None of us–youth or adult–is finished learning about how that works. Would you expect this to be what youth cared about most? Why? I’m reading an advanced copy now and loving it. And, not at all surprised the book was such a hit at EYE. I feel like youth and young adults want to see a relevant church, a church that sees injustice and then responds rather than a church that turns its back on the world to instead focus only on itself.